Heavenly blog! : No. 1067: Ansgar Braut being overprotected by hate-cops at Manglerud in Oslo, what is the reason that the Norwegian law does not apply to him but for everyone else? No. 1067: Ansgar Braut being overprotected by hate-cops at Manglerud in Oslo, what is the reason that the Norwegian law does not apply to him but for everyone else? Ansgar Braut being overprotected by hate-cops at Manglerud in Oslo, what is the reason that the Norwegian law does not apply to him but for everyone else? Ansgar Braut has with Torodd Fuglesteg and "Pastor" Jan Aage Torp immunity, it will probably keep on as long as they want with their criminal and heinous acts. Such investigation Hatpoltiet on Manglerud / Oslo engages, then all are criminals, even the most righteous! A ignore all what others say and do, and reinforces and amps it even more what the "culprit" (les innocents) does. How have I experienced police ala North Korea. I do not know, but there is a person who has an alias Ansgar Braut. That being overprotected by hate-cops at Manglerud in Oslo, what is the reason that the Norwegian law does not apply to him, but for everyone else? This police force is created with our tax payer's money to counteract hatred, but even they seem to be more hateful a second, why? Here comes the adage, physician leg itself really. This Ansgar Braut who send mails to employers and others. When Ansgar Braut wrote to a number of those discussed on my blog if they would go together in class actions against me also. Beside that they hate mails he has sent. All this is clearly a crime, but this Braut being protected by the so-called hat police Manglerud. Are we facing a police ala North Korea? He writes under various aliases and has found his peer in Torodd Fuglesteg. Each Jan Aage Torp that he would visit here in Oslo when he had a son whom he had here in Oslo. This he certainly written on the website Searchlight. Here are some of the documentation that we have on Ansgar Braut, who has also written I expect that Jens B Jensen and other aliases. That he is allowed to persist and keep on as he is doing, which is really criminal. But the police will take me for really nothing, it says here operates the so-called Hat group at Manglerud as if they were part of a government in the North Korea, not a free and delicious country like Norway! See here for an "anonymous" letter that we received that I think Ansgar Braut behind, who else? 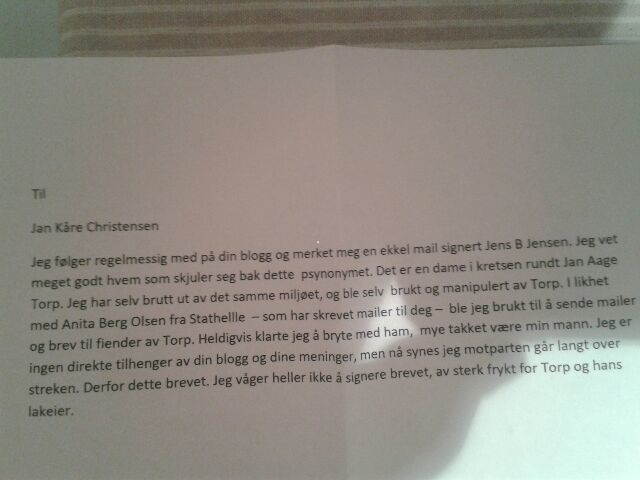 His companion with Torstein Fuglestad live in UK, so it can not be he who sends out these letters. Now his name is reportedly ............................................? See this in light of the false police report by Jan Aage Torp has made against me and that I was then forced to report him. Torp has tried to report me to cover that I have held forth what God's word says about a Christian that he is living in adultery if he / she remarries after a breakup. When live one in adultery by Scripture Torps review by me must be viewed as false. It is to cover another. Has experienced a slanderous threatening person who sent mail to me as I head not known before 2 October 2014 6:45 p.m. when the first mail came in. He threatens directly, should take me and writes that he will use his network of contacts to gag me then in the name of Jesus! This Jesus does not know me, but it is sinister and bad for us as a family to get such threatening mailer. Adds the mailer he has sent me and that I have answered. Penal Code § 135a ("Discrimination or proportionality based on religion or belief"), § 247 ("Defamation"), § 390 ("Personal Harassment"), § 5.8 (Threats) and to create fear. Believe he lives in Klepp in Rogaland. This is directly threatening, just keeps on writing the police report and spoke with a police detective who I of course does not name, has, inter alia gotten married couple Ingwersen watching this and my wife. People who I put my trust. This is more threatening thing: You have a very network which you will use to break with and get me into silence! Ansgar Braut I print all emails that I've taken care of, from the first tin the past. So that police get everything, you're the worst person I've experienced up to now as a Christian today. It tells a lot about you! Posted: 2 October 2014 6:45 p.m.
To "some": As I understand it, he lives with his wife, and it is registered a well adult son at address. However, if he had had minor children, I would long since have gathered together all the material I have, and sent an expression of concern for child welfare. However, one may of course ask whether his wife is as sick as him? Or if she is completely subjugated? Threatened into silence and subservience? JKC has no support from anyone: He even posted some declarations of support from Ingwersen. If Ingwersen really supported them, they would support him here. Neither the wife supports him! Nor children ... But why are they this man get hold of this madness? He must confine NOW! He obviously needs extensive help, and the community needs a looong break from him! I can confirm that I have submitted a thoroughly documented report to Unibuss AS. I received a confirmation from them that they had received several complaints on this bus driver. We must simply "pick apart" this wicked man, piece by piece ... .. I must say that I am not some superfan of Hanvold (for several reasons), but I want him obviously no harm, and he is definitely a man of God! At JKC dare to say that others living in sin is absolutely fantastic, all the time he himself living in sin. He steals and lying deliberately many times a day. And we know that God does not rank any sin worse than any other. I hope that it may soon be expedite Torps case with police, so this will hopefully be the beginning of the end for Christensen's life in public. Regarding whether he is mentally unbalanced / suffering from psyiatrisk disease, as have several questioned whether he is fit to drive the bus. On Tuesday I sent therefore an extensive mail to Uni-Bus, where I explains Christensen's activity online, and ask them to make an assessment of whether he is mentally fit to drive the bus. I got feedback from Uni-Bus today, where they confirmed having received several complaints about Christensen.